You can still make a collage for free with up to 6 images, but you can also create large collage with up to 20 photos for just 1$! Isn’t it affordable? Trying to monetize my simple website I added a feature where a visitor can pay just 1$ and will be able to upload up to 20 pictures for a collage, and create as many of them as he can within 24h. I use PayPal (which should accept also credit cards, you don’t have to register) and Daopay for SMS payments. Due to SMS prices it may be a little below or little over 1$ in local currency. In addition to SMS Daopay supports also payments via normal phone, where you just call a premium number for specific time. Both payment types have been tested, but let me know if something doesn’t work. 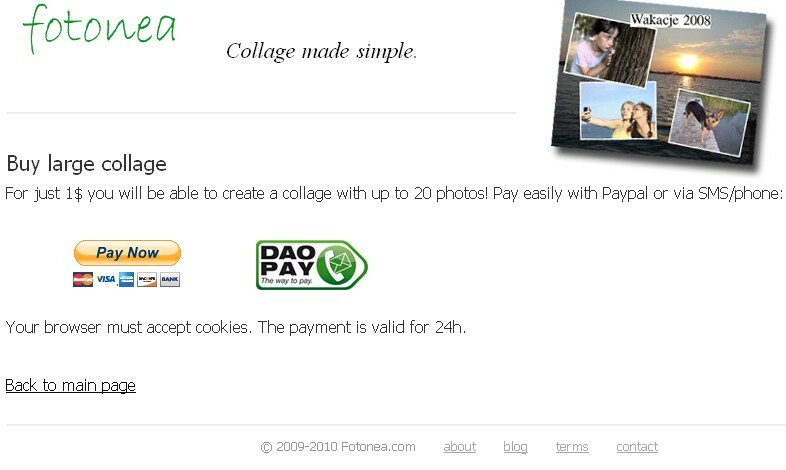 The payment acceptance is stored in a cookie, since fotonea.com does not require registration, so don’t clear your browser’s cookies if you want to create a number of large collages.